Ingenious assembling system allows fixing the modules to each other to create manifold combinations. The modularity principle allows us to perfectly adapt the Bubble configurations to the site and weather conditions. It also allows you to adjust and reinvent your accommodation progressively depending on your needs. You can make evolve your BubbleLodges infinitely as you like. The modularity principle: evolutivity, reactivity, maintenance, replacement. Use the application 3D Configurator to create your accommodation on-line. 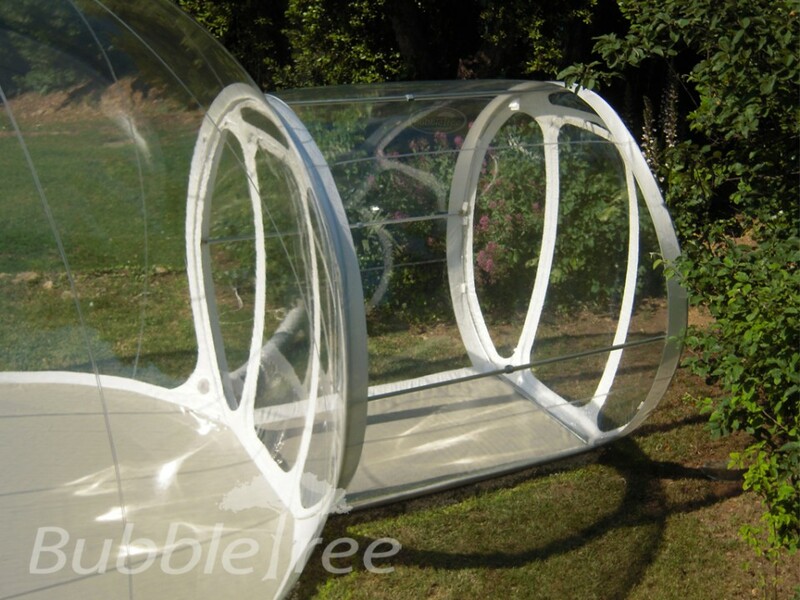 Mini Airlock Access Module: Transparent or white, it is designed to equip the Bubbles of 3,3 m in diameter. The standard complete ensembles of 3,3 m are offered with this module. Airlock Access Module: Transparent or white, it features two removable dividers with the doors. 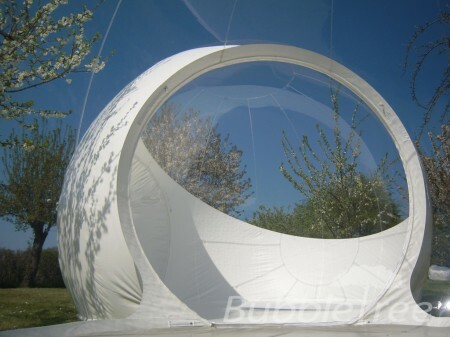 The standard complete ensembles of 4 m in diameter as well as BubbleSuite are offered with this module. Triangular Access Module: This passage allows you to create multiple combinations of the Bubbles. 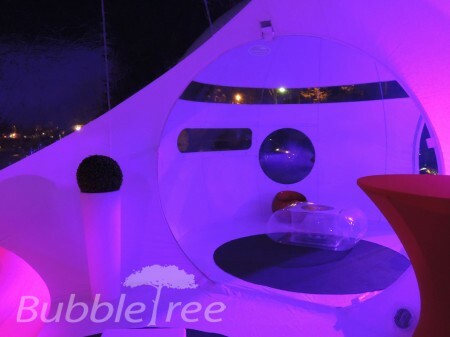 It can link 3 spheres or modules, or 2 elements allowing the entrance wherever you like. The range Bubble Lodges is designed to offer the maximum comfort to the guests, so we have conceived different bathroom modules. 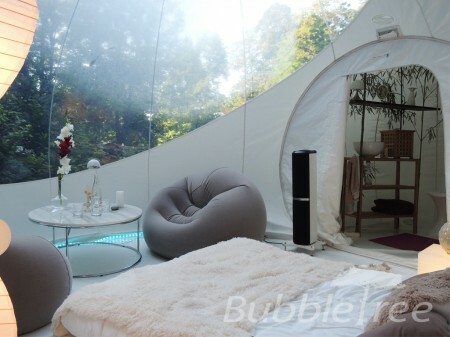 The standard BubbleSuite is offered with this module. Designed to accommodate a real bathroom with a bathtub. Depending on configuration, a supplementary ventilation system may be added. Other designs are available on request. Under the high humidity and evaporation conditions, the bathroom can advantageously be installed outside with the use of the Triangular Access Module. Please consult BubbleTree for more details. Having any of our Bubbles of the Bubble Lodges range, you can simply and quickly add to it an additional room. All the designs of the Bubbles of 4,4m and 4m in diameter with two openings at 120° are available. 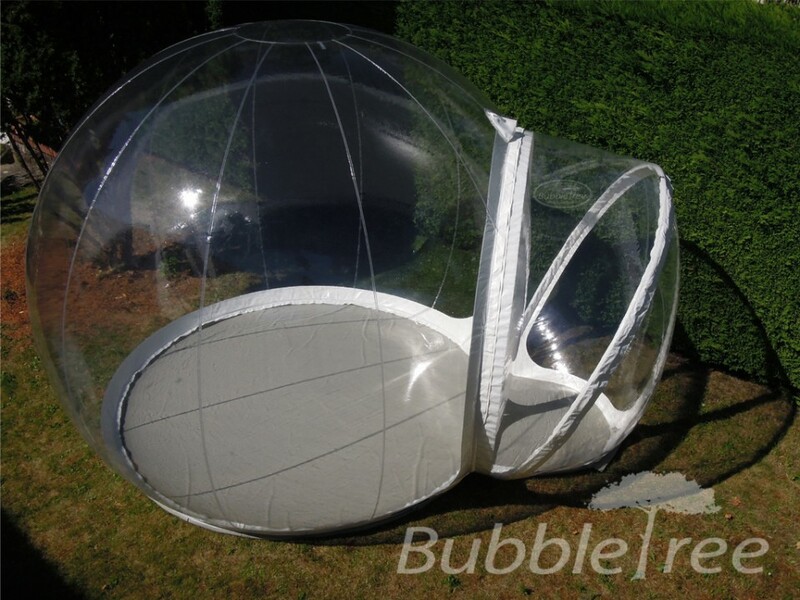 Moreover, depending on the configuration chosen, the Bubbles of 3,3m in diameter with one opening can also make an additional room. 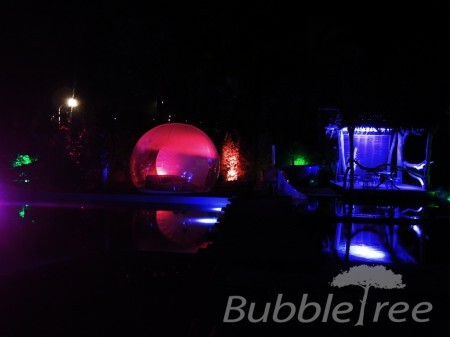 Bubbles are equipped with various elements depending on the configuration and conditions of installation. 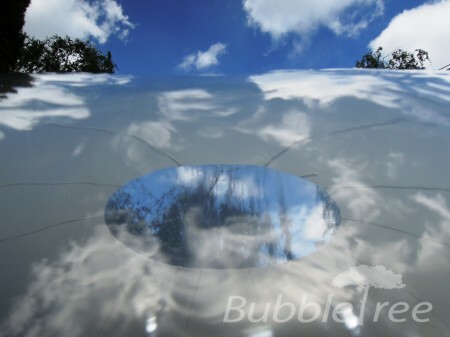 Air blower: Our Bubbles are equipped with low power consumption turbines (55 – 97W). They are plugged in, but can also function from a battery. A very low consumption version is available and ideal for achieving energy self-sufficiency; please consult BubbleTree for more information. Power inverter: Inverters (autonomy and security units) can ensure the autonomy of the turbines. Two power modes available. Modular wooden floor: Ensures perfect match to the floor of the Bubble and restrains the humidity flows; it is securely fixed to the ground with minimum damage. The height of 3 cm includes 1,5cm of technical sanitary void. The wood PEFC (CTBX) is resistant to permanent humidity (optional, recommended for nomadic accommodation without using a terrace). Dividers: The openings of the spheres and the modules of entrance can be closed or separated by transparent or opaque dividers. These elements can be with or without a door, and numerous versions are available. Heating system: We propose a range of solutions – a heater inside the Bubble, a system connected to the ventilation tube, ground-coupled heat exchangers for the geothermic solutions… The costs differ depending on the ground of the site. 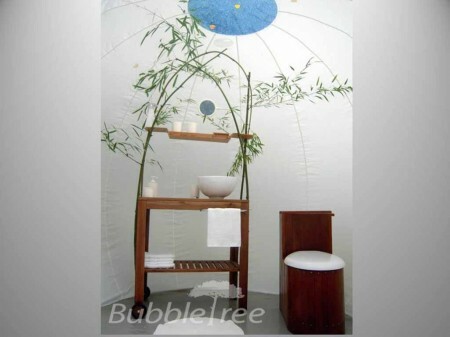 Dry toilets: Equip the bathroom sphere, using oak-tree or pine tree. 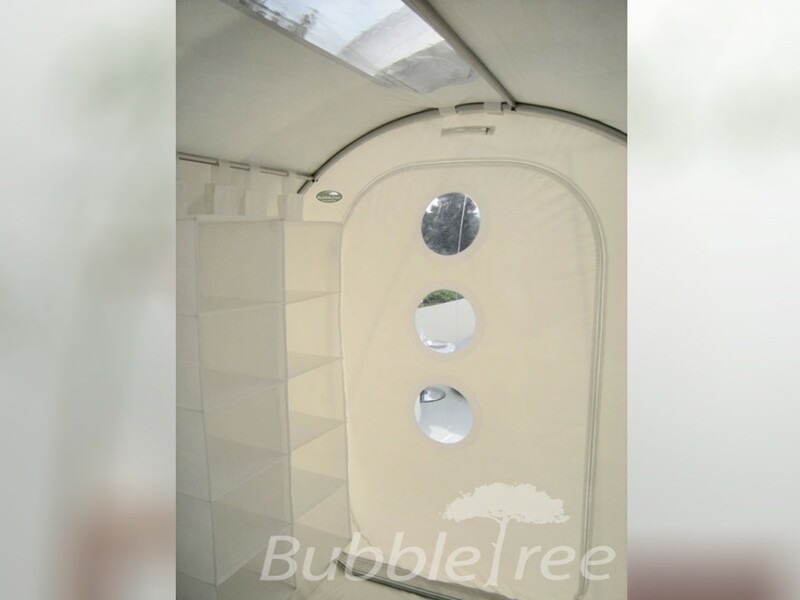 Shower tent: Equippped with frame, technical base, duckboard and siphon. this unit uses at best the volume of the sphere and drain off steam. Air conditioning: Numerous solutions can be proposed, including air blowers, Canadian wells, designer sunshields. BubbleTree accompanies you to help you apply the ecotourism principles to your Bubble accommodation adapted to the objectives set. 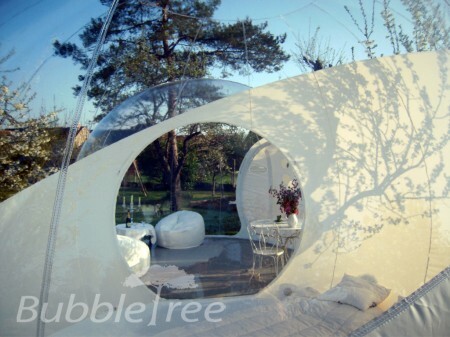 For the « thermal shield » and « low temperature » options please consult BubbleTree.